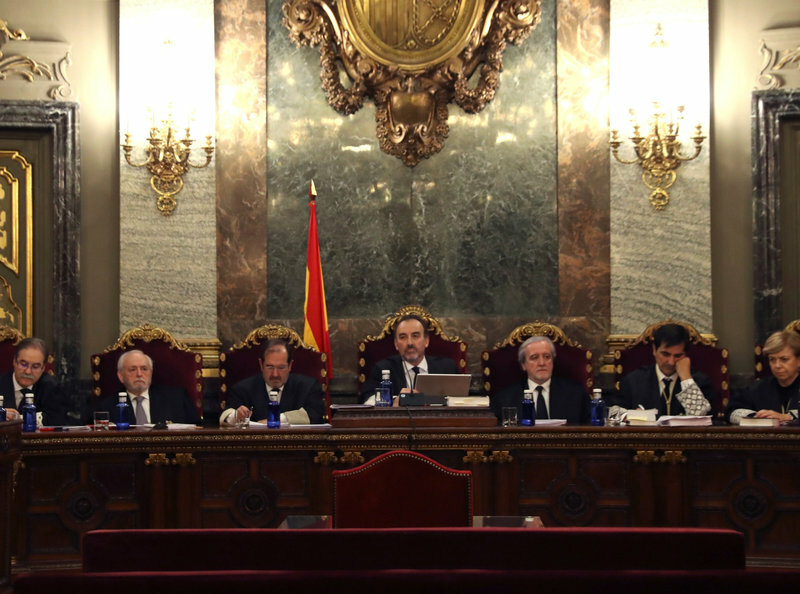 The Supreme Court judges who will try the case of the Catalan political prisoners, seen here last December ACN. The Supreme Court is still indefinite on the start date for the trial of the Catalan political prisoners, who participated in the organisation of the referendum on October 1st of 2017, and the subsequent declaration of independence. According to sources close to the tribunal, the 12th of February is an option, though the 5th of February, which was the last seemingly confirmed date after the end of January passed without the trials starting, could still be the start. Yesterday, Òmnium, whose former president Jordi Cuixart will be tried, added its voice to that of the Leftist Republican Party (ERC), demanding an additional three weeks time for defence preparations. The tribunal, made up of seven judges, has yet to rule on which witnesses will be allowed to testify, which in theory, needs to be completed before a specific date for the trial is agreed. The Supreme Court acknowledged that it is not accustomed to such cases and wants to be able to face the case with “transparency” because of the high expectations and importance of the trial. The tribunal also made it known that over 600 journalists have so far been accredited to attend, from over 150 different media outlets, a third of which are foreign, the majority of which are European. Journalists will rotate in the 15 press seats in the chamber, whilst additional spaces with live video links and big screens, for up to 300 people each will be available for media. The trial will be live-streamed on the Supreme Court website, and, exceptionally, a group of Spanish magistrates to resolve “doubts journalists might have as to the quality of the Spanish judicial system”.